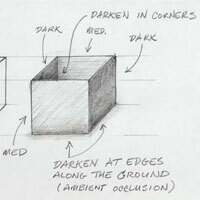 Pencil shading can create the illusion of depth in a drawing. There are a few simple techniques when making pencil drawings that will help you get the most out of your pencil illustrations. The typical pencils you may be accustomed to using are probably called #2 Pencils. A #2 pencil has a hardness rating of HB. More about pencil hardness below. Now let's get started with the "Drawing Pencil Sketches" drawing lesson. Pencils are rated based on their hardness and an HB is about the the middle of the hardness range. Typically you need to go to an art supply store or drafting supply store to buy harder or softer pencils. They usually don't have them in the office supply sections of the grocery store. Usually when writing with a pencil we write with a sharpened tip. 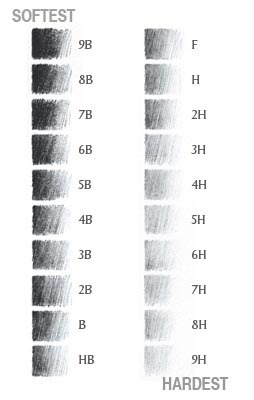 This sharp tip is also effective for shading in repetitive rows of lines in a technique called hatching. It's called that because it is not a continuous shading but rather rows of marks made side by side. 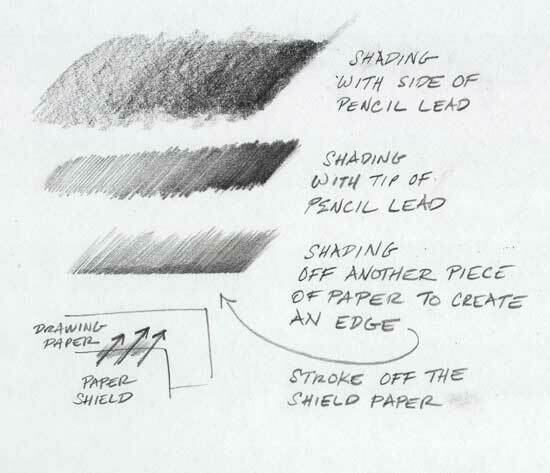 An alternate way to shade with the pencil is to use the side of the sharpened lead and rub it back and forth. This gives a very different texture from using the tip. 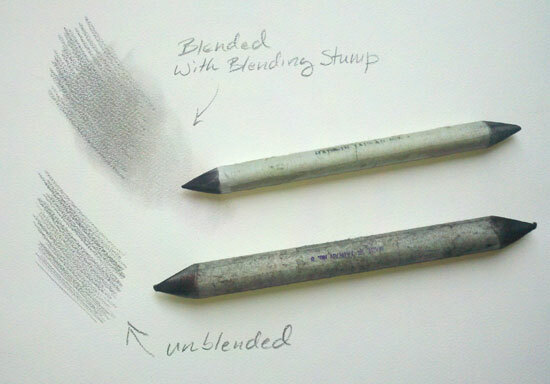 You can further blend this shading into a smooth tone by smudging and smearing it with a blending tool. You can find these paper blending stumps or tortillions in the art supply store, but some artist prefer to use cotton swabs or tightly rolled paper towel pieces. You may want to use your fingers, however you risk introducing oil from skin into your art and also will make your fingers dirty with graphite and then it gets hard to keep your paper clean. 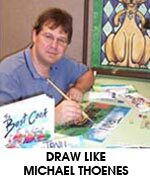 Some artist will scrape the graphite off the pencil lead with an X-acto knife or razor blade and smudge the graphite dust in to the paper with a blending tool. Below is and example of hatching and cross hatching. 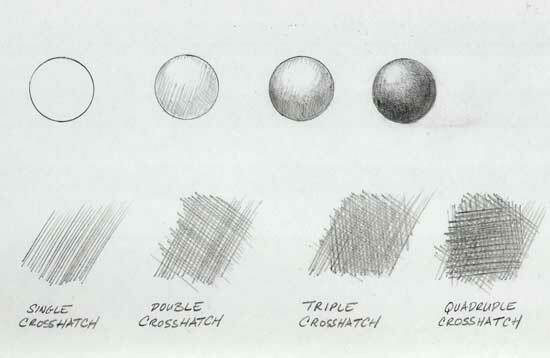 Cross hatching is simply when you hatch over an area you have already hatched but you do it at an angle to the previous set of strokes. This has the effect of progressively darkening the area you are shading by covering more of the paper with each pass. 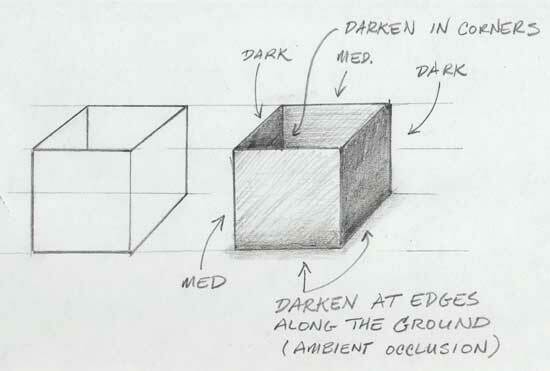 Below is and example of a shaded 3D box using mostly cross hatching to define the lighting on the box. in this example we presume a soft light coming primarily from the front and left. Therefore, the right facing planes are shaded darker than the forward facing planes. When light bounces off objects, it can get trapped in the corners and along edges where it no longer bounces towards our eyes. If you look at the corners of a room, you can see this subtle darkening. This is effect is called ambient occlusion and adding shading to your drawing to mimic this behavior of light in the real world adds realism to your drawings. Congratulations you have finished this online art lesson, Drawing Pencil Sketches"
If you can hold a pencil you can draw animals. 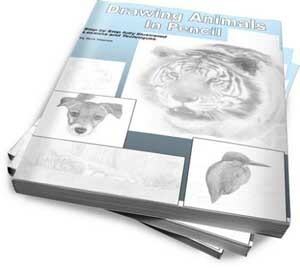 Learn how to draw animals in pencil Click Here!